Photo credit: Adapted by WhoWhatWhy from National Archives / Wikimedia and OpenClipart-Vectors / Pixabay. 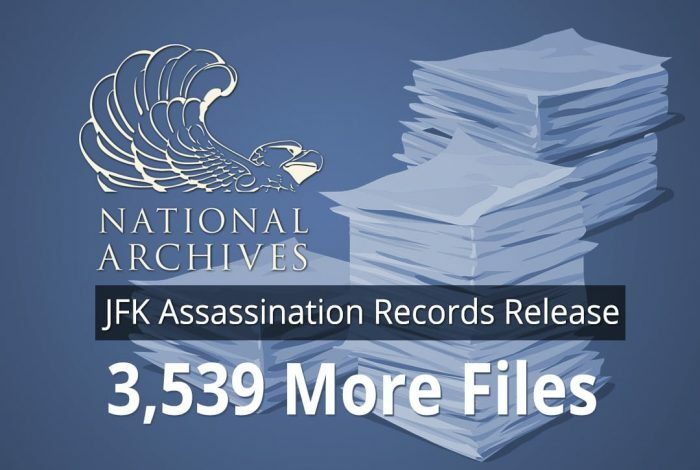 The National Archives and Records Administration (NARA) today released its sixth 2017 batch of records that may in some way relate to the assassination of President John F. Kennedy. The agency’s press release states that this latest cache includes 3,539 documents. It appears that 1,240 files are labeled “withheld-in-full,” meaning the public has never seen these documents before, and 2,259 labeled “withheld-in-part”, meaning they had previously been released to the public, but with some information blacked out. Yet another 439 files on their index give no indication at all of their status. The documents from this release appear to originate from a mix of government agencies including the FBI, CIA, Army, NSA, and various congressional committees — although approximately 35 percent of the documents listed are not labeled in NARA’s index with an originating agency. At this point, with the exception of 86 record identification numbers where additional research is required by the National Archives and the other agencies, all documents subject to section 5 of the JFK Act have been released either in full or in part. Any information subject to section 5 of the Act, which has been redacted from documents in any of the six public releases this year, remains subject to further review by the agencies and the National Archives, in accordance with the President’s direction. The National Archives will release additional documents in 2018 based on the outcome of the reviews conducted pursuant to the President’s direction. If you haven’t been keeping up with the drama surrounding JFK records release, by law all of the remaining JFK assassination records — those never seen before, and those previously released with redactions — were supposed to be released in unredacted form on October 26. The anticipation was high, and was fueled by tweets from President Trump announcing the release. But it didn’t happen that way. Instead, the president granted the various agencies a six-month “re-review” period in which they could assure themselves no sensitive information would be revealed that needed to stay redacted for “purposes of national security.” The deadline for this re-review period is April 26, 2018. It remains to be seen what percentage of the redactions the various agencies will unredact by the April deadline. Thus far, only a few of the documents have drawn keen interest — in part, perhaps, because of the unlikelihood that any “smoking gun” documents ever existed, or if they did, the likelihood they have already been removed from government files. Still, experts and aficionados expect to find “breadcrumbs” that, put together, can help paint a better picture of what did happen on November 22, 1963 in Dallas. Polls have consistently shown that the public doubts the conclusion of the Warren Commission that Lee Harvey Oswald, acting alone, was responsible. WhoWhatWhy’s research team has been diligently sifting through these documents since the first release, sorting and analyzing them to try and understand their significance. Stay tuned as we bring you the latest. Related front page panorama photo credit: Adapted by WhoWhatWhy from JFK (National Archives), National Archives building (National Archives) and National Archives Logo (National Archives / Wikimedia).